Join us at our Hell for Leather Season Opening Weekend on the 6th and 7th April to kick start the new season. 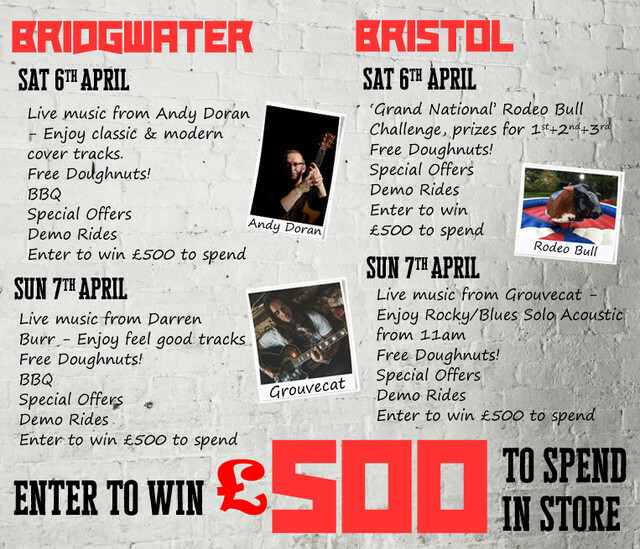 We’ve also got live music in both stores* and will be firing up the BBQ in Bridgwater. Demo rides are available on both days plus special offers aplenty. Very very special offers will be available on all leather products in store this includes race suits, jackets, trousers, boots, belts and wallets. You also have the chance to win £500 to spend in store**. You only need to enter your details on the day to have the chance to go ‘wild in the aisles’ at Riders with £500 to spend on clothing, accessories or parts. Get the dates in your diary and tell your friends. We can't wait to see you on the day! Go Hell for Leather at Riders of Bridgwater and Bristol on Saturday 6th April from 9am to 5pm and Sunday 7th April from 10am to 4pm.